Love Caesar salad but are watching your waistline? 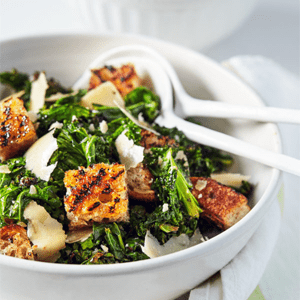 We’ve created a healthier Caesar salad that still includes Parmesan cheese, garlic croutons, lemon garlic dressing! We used grilled kale, but if you don’t want to spend the time grilling it, using raw kale works too. Just massage the dressing in to reduce the bitterness of the leafy green! To make dressing, combine half of garlic, lemon juice, and salt in a small bowl; whisk to blend. Slowly add 2 Tbsp. oil, whisking continuously until blended. Set aside. Combine remaining 2 tsp. oil and remaining half of garlic in a small bowl; mix well. Set aside. Remove central rib and stem from each kale leaf. Brush leaves with half of oil and garlic mixture. Set aside. Brush bread with the other half of oil and garlic mixture. Set aside. 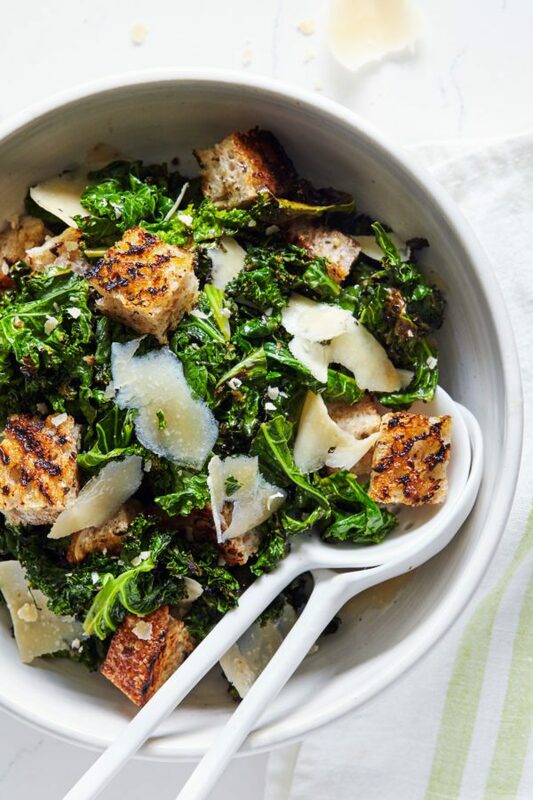 Grill kale for 30 seconds to 1 minute on each side, or until slightly brown and crispy. (Kale might need to be grilled in batches.) Cut (or tear) into bite-sized pieces. Set aside. Grill bread for 1 to 2 minutes on each side, or until brown and crispy. Cut into large cubes. 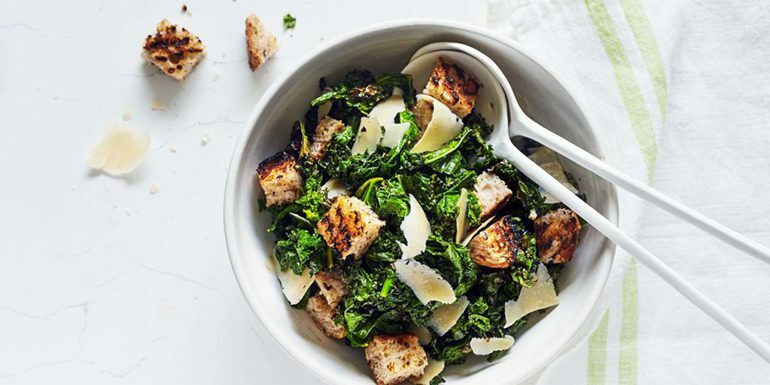 Combine kale and bread in a large serving bowl. Drizzle with dressing; toss gently to blend.